Avid is about to update its Sibelius music notation software to version 8, a version that you’ll have the opportunity to discover at Musikmesse. British duet StaffPad developed a music notation app designed for use with a stylus on touch computers and tablets running Windows 8.1. The free MuseScore music notation software will be upgraded to v2 in a few days, and a public beta version is already available for download. 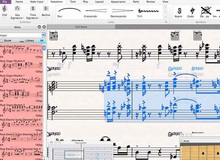 PreSonus has released version 5.1 for its Notion music notation software, which mainly fixes issues reported by users. Avid will offer online music selling platforms the integration of the new Sibelius Cloud Publishing service to their websites. Opusmodus is a new software designed for creating music scores from scripts. It is developed by an international team. The PreSonus booth at Summer NAMM 2014 is full of surprises, and visitors will have the opportunity to discover the first images of Notion 5.